Welcome to 'Twid Central:' home to Twiddly.Bits, the longest-serving and still coolest MIDI sample loop libraries on the planet. 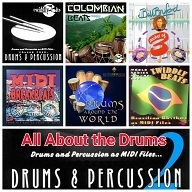 MIDI Samples are MIDI recordings of real musicians playing real instruments or controllers. If you're still a bit uncertain exactly what MIDI is, or what it can accomplish, take a look at a preview of the MIDI scene from Alan Parsons' acclaimed Art & Science Of Sound Recording series. If you'd like to see more, we're giving away a free download of the full scene with each and every purchase here on MIDISamples.com. A link to the download will just magically be supplied on checkout! Our libraries are 'pure MIDI'. 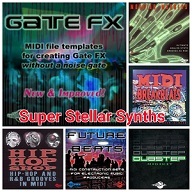 They�re delivered as a series of individual MIDI files you can drag and drop into your DAW or MIDI-enabled app. MIDI might still be in Version 1.0 but its application has developed in ways that even its champion and creator Dave Smith (yes, that Dave Smith of Dave Smith Instruments) could only have fantasized about back in 1983. With web MIDI poised to open up this world of limitless possibilities to a whole new generation, now is the perfect time to pick up some of our choice cuts � drum loops, bass lines, guitar parts, synth wobbles and gazillion other morsels of musical magic lovingly played and performed by our roster of international players. Check out Foundations Of Music�MIDI�s most compelling and pain-free educational aid. Twiddly.Bits - live MIDI parts played by professional studio musicians. New site, new deals! Check out some great specials in the store! * To apply the quantity discount specials, place the code (either 12PACK or 420) in the Coupon field when prompted during checkout.